Traditional mashed potatoes are the ultimate comfort food. But they can be laden with a lot of extra fat, calories and carbohydrates. In this Cheesy Cauliflower Mashed Potatoes Recipe, I used cauliflower instead of potatoes. Surprisingly, it tasted pretty similar to actual potatoes, but lacked that pasty feel. Using the cauliflower allowed the dish to require less fat or oils in order to taste good and blend well, also, cauliflower is lower in calories and carbs than potatoes, so I was able to create a dish that tasted very similar to cheesy, garlic mashed potatoes, but for just 2 Points per serving. Using the cheese and the garlic in this low calorie side dish recipe really helped to add some incredible flavor and help the cauliflower take on a similar texture to actual mashed potatoes. It was a delicious and low calorie side dish recipe that is definitely something that I’ll be making again and again! Even my super picky husband liked it. :)These Cheesy Cauliflower Mashed “Potatoes” made for a very filling, and very tasty Weight Watchers Recipe that I would highly recommend trying. Enjoy! 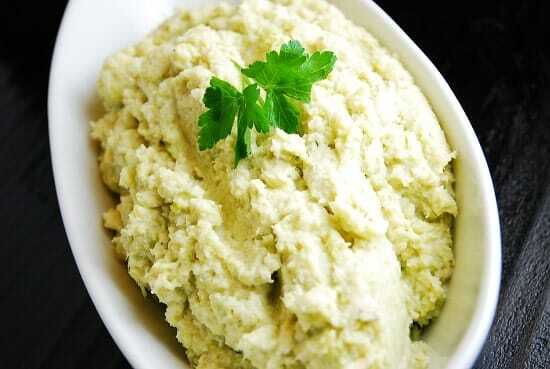 Enjoy the flavor of mashed potatoes in this incredible low calorie recipe that uses cauliflower instead of potatoes. Full of vitamins and minerals, and just 2 Points+ per serving, this healthy side dish recipe offers a great new outlet for cauliflower. Place cauliflower florets into a large pot and cover with water. Bring to a boil, and let cook until cauliflower is tender, about 15 minutes. Strain cauliflower from water, reserving some of the water, and empty cauliflower into a large bowl. Add in butter, garlic and cream cheese. Using a hand masher or large fork, smash the cauliflower as much as possible. Then add in the parmesan cheese, and using an immersion blender, puree all ingredients together until desired texture is reached. Add in some of the reserved cooking water if needed. Serve immediately. I have just joined WW two weeks ago and love it since I lost 5.5 lbs and shrinking. This will be my new way of life. Since I am new to this way of eating, I was afraid to use cream cheese, so I just used lite butter, salt, cayenne pepper, and chive flakes. Yummy recipe. I added more cream cheese and butter, and just a few splashes of water. Will def make again! Awesome recipe! I made exactly as it reads, although next time I might also boil the garlic with the veggie so it’s not as strong. I paired it with the Skillet Pork and Cabbage recipe! I’ll admit I was skeptical but this cauliflower mash was fabulous!! I can’t say it tastes exactly like potatoes but I can say it tastes better than any mashed potatoes I’ve ever made!!! Just made this dish. Probably will boil the garlic cloves whole with the florets…raw garlic was pretty harsh. But otherwise a keeper! This sounds wonderful. I use cauliflower in so many potato substitute recipes! Can’t wait to give this a try.